Canine Choice Puppy Large is a complete grain-free dry food for puppies of large breeds (adult weight over 25 kg). It has a high proportion of meat (60%). 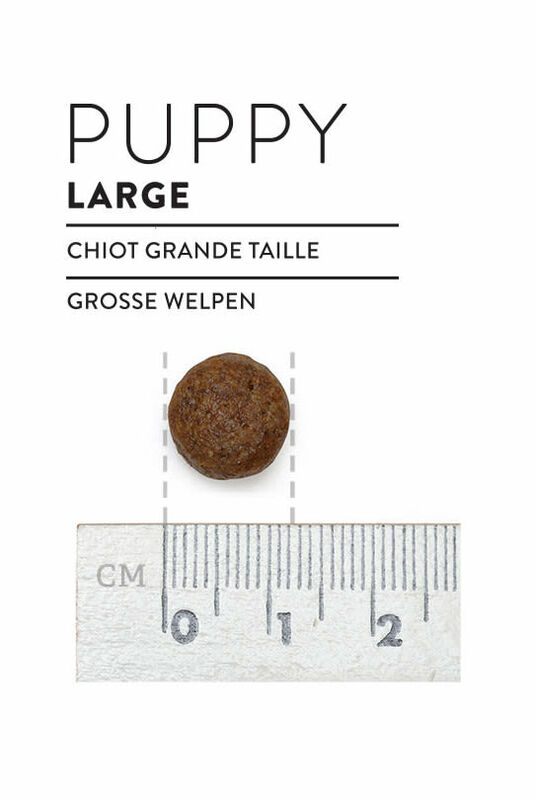 The recipe for large puppies has fewer calories than our recipe for smaller puppies. It promotes a healthy weight while supporting bone and joint growth. 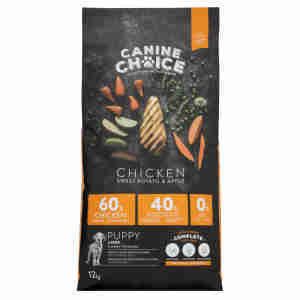 Canine Choice Puppy Large can be fed from 6 weeks of age through to 18 months. For puppies that are only weeks old, we recommend soaking the kibble in lukewarm water. “If you want something done right, do it yourself”– words our resident vet, Andrew, really took to heart when he’d had enough of substandard dog food and created Canine Choice. Dogs don’t need cheap fillers and allergens like beef, wheat and soya – they need a meat-rich, high-quality, balanced diet, and pet parents need to know they’re getting the best possible value for their money. impartial dog food rating site All About Dog Food. Click here to learn more. We care about what goes into your puppy’s tum: Andrew and us on the Canine Choice team put loads of thought, care and expertise into the ingredients so they’re worth a read! Fresh chicken (34%), Dehydrated chicken (21%), Sweet potato (15%), Peas (9%), Hydrolyzed chicken liver (5%), Apple pulp (5%), Dehydrated carrot (0,32%, equivalent to 3% carrots), Dehydrated cranberries (0,08% equivalent to 0.75% cranberries), Chicken fat, Brewer’s yeast, Fish oil, Minerals, Chicory (source of FOS), Mannan-oligosaccharides (MOS), Camomile, Parsley, Rosehips, Sea algae, Rosemary, Cloves, Glucosamine (350 mg/kg), Cartilage (a source of Chondroitin 250 mg/kg), Yucca schidigera. Crude protein 29%, Crude oils and fats 18%, Crude ash 7.50%, Fatty acids (Omega 6) 3.56%,Crude fibres 3.25%, Calcium 1.40%, Phosphorus 1%, Fatty acids (Omega 3) 0.40%, Metabolizable energy 3950 kcal/kg. Vitamin A 20.000 IU/kg, Vitamin D3 1.850 IU/kg, Vitamin E 600 mg/kg, Vitamin C 300 mg/kg, Zinc (Zinc oxide) 108 mg/kg, Iron (Ferrous sulphate, monohydrate) 68 mg/kg, Copper (Cupric sulphate, pentahydrate) 9 mg/kg, Manganese (Manganous sulphate, monohydrate) 7 mg/kg, Iodine (Potassium iodide) 3.2 mg/kg, Selenium (sodium selenite) 0,11 mg/kg. Bacillus subtilis C-3102 (DSM 15544) 1 x 1,000,000,000 CFU/kg (Probiotic). Antioxidants: Tocopherol extracts of vegetable oils (135 mg/kg). 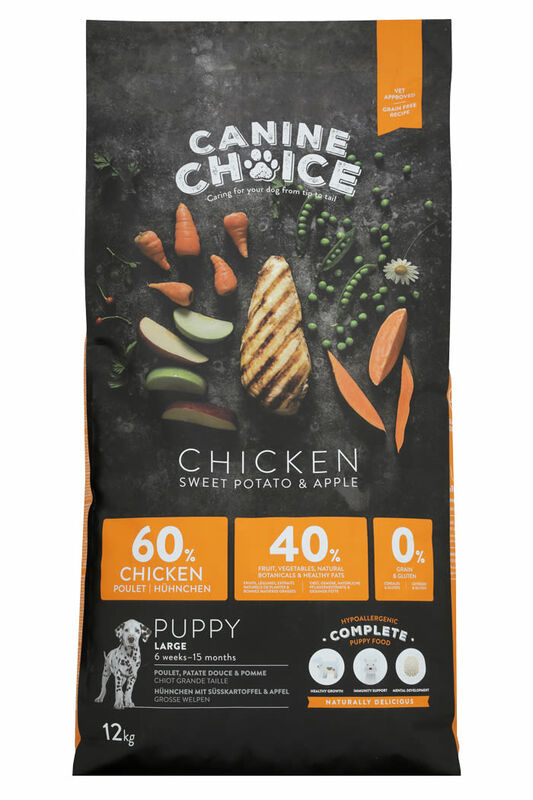 If this is the first time you’re feeding your puppy Canine Choice, it’s easy to switch from their current food over the course of a few days. Start off by replacing 25% of their existing food with this one, then increase the amount of the new food by 25% every other day until they’ve fully made the switch. When your puppy is weaned but under four months old, serve the food four to five times a day by mixing it with lukewarm water in the proportion of one part water to three parts food. Remove any left-over food after a short time. When your puppy is nearly one year old, begin to reduce the number of servings per day until your dog is having just two meals. And one last thing – we know a feeding table isn’t the most exciting thing to study, but please do take care to read it, as your puppy is likely to need a different amount of Canine Choice per day than their previous diet (as it’s so full of goodness and energy per gram). As with any diet change, it’s good to keep an eye your pet's weight. My chow chow rolo absolutely loves this, not a drop left in his bowl. Love the ingredients in this dry dog food and the small bite size pieces. My German Shepherd puppy 11 months old loves this it fact woofs it down.